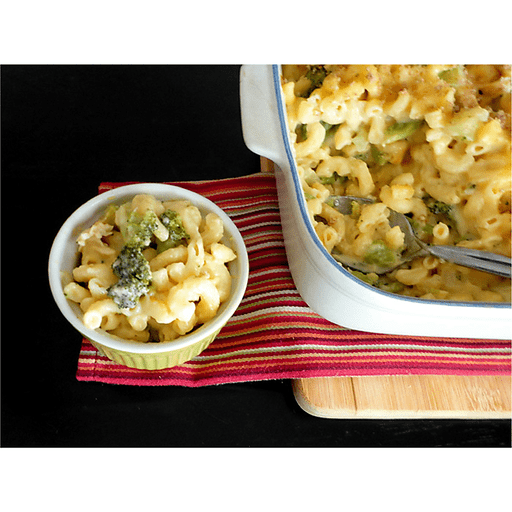 This Cheesy Broccoli Chicken Mac is a delightfully creamy, updated version of a childhood favorite that kids and adults alike will enjoy. Simple and better-for-you dinners like this one are tough to beat! 1. Preheat oven to 375°F and spray a baking dish with cooking spray. Steam frozen broccoli in microwave according to package directions and cook pasta until al dente. 1. Meanwhile, in a large, heavy skillet, melt butter with canola oil. Add onion and cook over low heat for about 2 minutes. Add flour and cook another minute, or until the flour is golden and well combined. Slowly add chicken broth and milk while whisking, and raise heat to medium-high until it comes to a low boil. Cook about 5 minutes or until the sauce becomes smooth and thickened. Season with salt and pepper. 1. Once the sauce is thick, remove the pan from the heat and stir in cheese, mixing well until completely melted into the sauce. Adjust salt and pepper to taste. Stir in cooked macaroni, steamed broccoli and cooked chicken. Pour mixture into the prepared baking dish. 1. Bake for 15-20 minutes, until bubbling and starting to brown around the edges. Serve warm. If desired, top with a light sprinkle of bread crumbs prior to baking. For gluten free: Use gluten free pasta instead of standard pasta and gluten free flour instead of all purpose flour. Calories 380, Total Fat 14g (Saturated 6g, Trans 0g), Cholesterol 50mg, Sodium 410mg, Total Carbohydrate 44g (Dietary Fiber 6g, Sugars 7g), Protein 23g, Vitamin A 20%, Vitamin C 45%, Calcium 50%, Iron 10% *Nutritional values are an approximation. Actual nutritional values may vary due to preparation techniques, variations related to suppliers, regional and seasonal differences, or rounding.